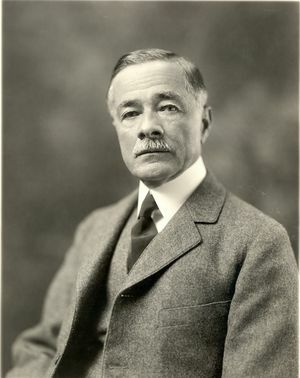 John J. Carty, AIEE President, 1915 - 1916, designed the “bridging bell”, which allowed extended telephone use to rural areas of the United States. Carty also announced AT & T’s intention to complete a transcontinental telephone line. On 27 December 1932, John J. Carty, president of the American Institute of Electrical Engineers in 1915-1916, and winner of the Institute’s highest honor, the Edison Medal in 1917, passed away in New York City. Carty’s was a most remarkable fifty-one year career that began in 1879 as a telephone operator at the very start of the technology, and ended fifty one years later as Vice President of AT&T and Chairman of the Board of Bell Telephone Laboratories. Carty was born in 1861 in Cambridge, Massachusetts. While admitted to Harvard, he chose, because of what turned out to be temporary vision problems, to seek work instead. That decision led him, in 1879, to the Telephone Despatch Company, Boston’s first telephone exchange, where he began work as an operator on one of the first switchboards. Soon after, he moved on to more technical work with what became the New England Telephone Company. Being an inventive young man in a rapidly evolving young industry, he made a series of improvements and inventions. In 1880, his first invention employed a common battery sending power down the telephone line instead of individual batteries at each receiver. After considerable additional improvements, this arrangement became standard around 1900. In 1881, he was called on to troubleshoot the world’s first long distance telephone line, which connected Boston and Providence. Like all telephone lines of the time, it employed a single wire and ground return circuit. Though such an arrangement was satisfactory on shorter lines, it worked poorly here due to both interference and signal attenuation. Carty demonstrated that using a two-wire or metallic circuit solved the problem. Metallic circuits became standard as long distance lines proliferated, and in the 1890s began replacing single wire lines on local circuits as well. In 1886, he received a patent on a phantom circuit using repeating coils, which allowed three conversations to be transmitted down two pairs of wire. Carty’s work gained recognition throughout the growing Bell Telephone System, and in 1887, he left New England Telephone for a supervisory position with Western Electric, Bell’s manufacturing subsidiary in New York. There, he was first head of the cable, and then the switchboard department. After two years at Western, he moved again, this time to be Chief Engineer of the Metropolitan Telephone and Telegraph Company, the telephone operating company serving New York City, and thus the largest telephone operating company in the world. It was quite an achievement for a twenty-eight year old. Carty made an exhaustive investigation into the nature of the disturbances to which telephone lines are subjected, and gave the first public account of his work in a paper entitled, "A New View of Telephone Induction," read before the Electric Club of New York city on 21 November 1889. In this paper, he showed the overwhelming preponderance of electrostatic induction as a factor in producing cross-talk. The article gave directions for determining a silent or neutral point where no cross-talking may be heard, and described original experiments showing how to distinguish between electrostatic and electromagnetic induction in telephone lines. For this he received U.S. patent 442,856 in 1890. In March 1891, Carty made additional contributions to the knowledge of this subject in a paper before the American Institute of Electrical Engineers, entitled, "Inductive Disturbances in Telephone Circuits." Prior to his work on the subject, the number of telephone stations which could be operated upon one line was greatly restricted because of the impediment offered to the voice currents by the presence of the signaling bells, and on account of the inductive disturbances which these bells caused. These conditions made it impracticable to extend the telephone to the rural districts owing to the prohibitive expenses involved in providing each customer with a circuit of his own. Carty devised a mechanism known as the "bridging bell", patent 449,106, whereby any number of stations that might be required could be placed upon one line without in any way impairing the transmission of speech or introducing disturbing noises. The simplicity and cheapness of the device and the extraordinary success which attended its working resulted in an immediate extension of the telephone into rural districts and the placing of the telephone in the homes of millions of farmers in America and abroad which had formerly been isolated. For this achievement the Franklin Institute of Philadelphia conferred upon him the Edward Longstreth Medal of Merit in 1902. Carty had joined AIEE (IEEE’s predecessor) in 1890, but only presented his first paper before the AIEE in 1906. Titled “Telephone Engineering,” it was a broad essay on the responsibilities, and ethics of telephone engineers, or by inference, engineers in general. Shortly after Theodore Vail returned as President of AT&T, the parent company of the Bell System, in 1907, he named John Carty AT&T’s Chief Engineer. Carty centralized most of the Bell System’s engineering research and development at Western Electric in New York. While visiting San Francisco in 1908-1909, he concluded that the west coast was isolated by the lack of telephonic connections with the rest of the United States; as a senior telephone company official, he was accustomed to using the long distance lines. Together with Vail, Carty made AT&T’s opening of a transcontinental telephone line AT&T’s top technical priority, and in 1911 he announced publicly that AT&T would have such a line open in time for the celebrations planned in San Francisco for the completion of the Panama Canal. Carty knew that transcontinental telephony was more than a construction project; what was needed was a way to amplify electrical signals. He needed research to produce a scientific breakthrough, so in 1910, he hired a bright young physicist, Harold Arnold, to provide one. In 1913, Arnold succeeded by increasing the level of evacuation of independent inventor Lee De Forest’s invention, the Audion three-element vacuum tube, turning it into a practical amplifier. With three of Arnold’s high-vacuum amplifiers in place, the line opened for service to great fanfare on 24 January 1915. Later that year, Arnold and AT&T successfully used these amplifiers to transmit the human voice across the Atlantic. Carty, who already was an advocate of that then-new institution, the industrial research lab, was now even more firmly convinced of its importance, since in-house research had given AT&T the technology needed to accomplish its goal of connecting the country. Thus Carty chose as the topic for his AIEE Presidential address, given at the 1916 AIEE Annual Convention, “The Relation of Science to Industrial Research.” In it, he urged all industries to adopt the practice of in-house industrial research. His continuing championship of industrial research led Carty, in 1925, to separate the Bell System’s industrial research laboratory from Western Electric, and establish it as a separate AT&T subsidiary, Bell Telephone Laboratories. Bell Labs is generally regarded as the most important industrial research laboratory of the twentieth century. Carty served as Chairman of the Board of Bell Labs from 1925 until his retirement in 1930. In 1915, concerned that the United States might find itself drawn into the Great War that had already begun in Europe, Carty offered his and the Bell System’s communications expertise to both the U.S. Navy and Army, and began planning for the military’s possible communication needs. Carty took leave from AT&T to become a Major in the U.S. Army Signal Corps. Once the U.S. joined the war in 1917, Carty was able to quickly put in place the plans he had developed for the Signal Corps to construct a state-of-the-art telephone and telegraph system for the U.S Army Expeditionary Force – a system far more advanced than any Europe had seen. Within a few months, he had brought 4,525 Bell System employees into the Signal Corps to successfully implement his plan, as well as groups of the Bell System’s female operators to actually operate the system from switchboards, some quite close to the front line. For his service, the United States Army awarded Carty the Rank of Brigadier General in the Officers Reserve Corps in 1921. Carty became a fellow of the AIEE in 1912, and the eighth recipient of the AIEE’s highest award, the Edison Medal, in 1917. Carty was the second telephone engineer to be so honored, following only Alexander Graham Bell himself. Carty was also awarded the Franklin Medal (1916), and the John Fritz Medal (1928). The Emperor of Japan decorated him with the Order of the Rising Sun in 1909, and with the Imperial Order of the Sacred Treasure in 1912, in recognition of his achievements as an engineer, and in view of the services he rendered to the Japanese government in connection with electrical engineering matters. He was also a member of the Society for the Promotion of Engineering Education, the Society for the Promotion of Industrial Education, the New York Electrical Society, and the Society of Arts. After the War, Carty returned to his civilian position as AT&T’s Chief Engineer, becoming a Vice President of the company as well. He retired from AT&T in 1930, at the age of 69 with fifty-one years of service, and died two years later, on 27 December 1932 of complications following surgery. Carty was married on 8 August 1891, to Marion Mount Russell, and had one son, John Russell.